Originally published in the Journal de Montréal on March 5, 2011. 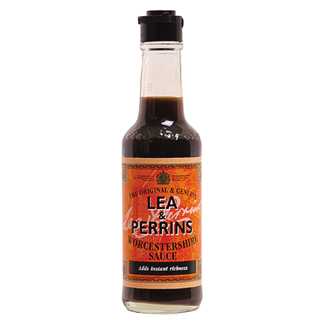 Worcestershire sauce is a dark condiment with a sweet-and-sour and slightly spicy flavour; it is used for preparing a large variety of dishes like steak tartar, Caesar salad, and also for flavouring cocktails such as the famous Bloody Mary. This sauce was first created in Worcester, Great Britain by two chemists, John Lea and William Perrin: its original preparation had such a foul taste that it was kept aside in a barrel and forgotten! But three years later, when the barrel was rediscovered, the sauce had fermented and become tasty. From the time that the first bottles were sold to the public in 1838, the sauce became a terrific success. This condiment contains vinegar, garlic, shallots, soy sauce, tamarind extract, molasses, lime, anchovies and spices. But like Coca-Cola, the exact recipe still remains a secret. The American giant Heinz purchased this brand in 2005 and continues to produce and sell it under the name “The Original Lea & Perrins Worcestershire Sauce”. Curious as to how to pronounce the word “Worcestershire”? Listen here.